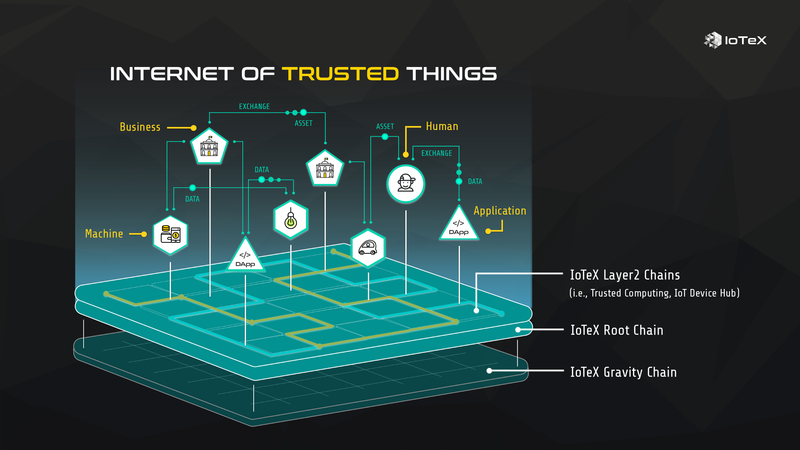 IoTeX began our journey in 2017 to build the Internet of Trusted Things, where all physical and virtual “things” — humans, machines, businesses, and dApps — can efficiently exchange information and value at global scale. Throughout the past two years, we built IoTeX from scratch and devoted ourselves to delivering new innovations to the blockchain industry. This is manifested in Mainnet Alpha, which delivers a state-of-the-art Root Chain on which new Layer 2 chains, tokens, dApps, and businesses will be launched. The Internet of Trusted Things will change the world; however, it takes a special kind of blockchain to bring this vision to reality. IoTeX is the only blockchain platform capable of powering the Internet of Trusted Things. From Day 1, we made upfront design decisions to tailor fit IoTeX to support data privacy, trusted computing, large-scale IoT, interoperability, and big data use cases. By serving as the infrastructure to unify all “things”, IoTeX will power the new decentralized economy. EVM-compatible execution unit: Mainnet Alpha uses Ethereum Virtual Machine (EVM), which is widely used by blockchain developers. Existing EVM-based dApps can be ported over to the IoTeX Network starting now! In the future, we will use EVM as a standalone execution unit for edge devices and develop an in-house IoTeX Virtual Machine, interpreter, and corresponding programming paradigms for decentralized computing. As shown in our roadmap, 2019 will be an action-packed year for IoTeX. With a robust Root Chain foundation in place, the next steps of adding new L2 chains (i.e., trusted computing, IoT device hub), open source tools (i.e., SDKs, explorers, wallets), and dApps/services (i.e., DEX, stable coins, oracles) will involve the entire IoTeX developer and user community. Let us celebrate this major Mainnet Alpha milestone together and look forward to the journey ahead — let’s build the future together!